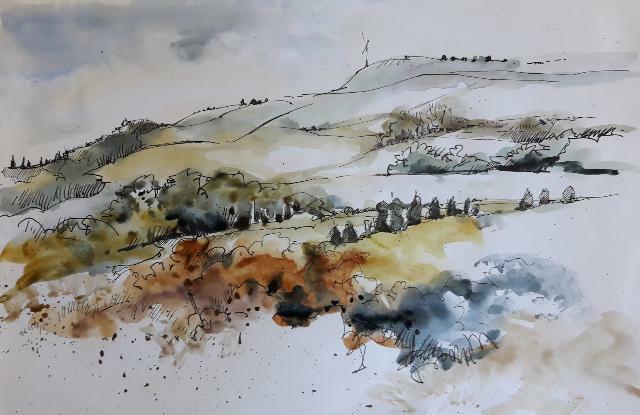 For a long time now I’ve been thinking of ways I could share the experience of walking about in the park with a sketchbook – not just by showing other people what I do but by giving them the chance to do it themselves, and get to know how it feels. 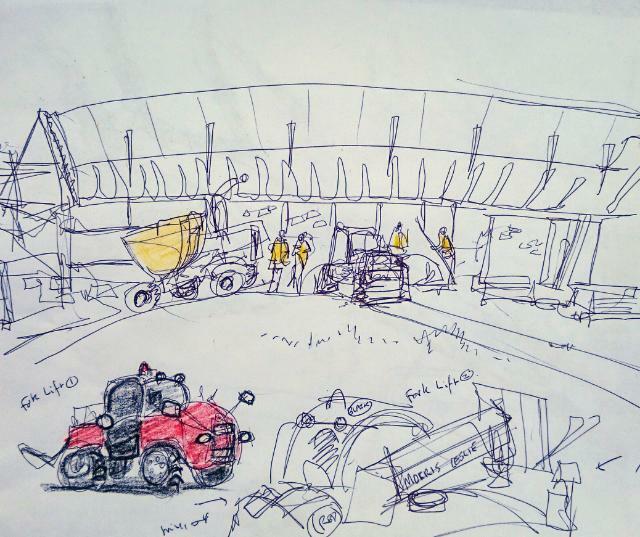 Some months ago I was excited to get together with Louise Garrett – a sketching friend and fellow member of Yorkshire Urban Sketchers – and we started to plan ways we could do this. Last Thursday we ran our first experimental Sketchwalk. We wanted to make this a welcome-all-comers occasion, something that would be enjoyable for people who’d never sketched before as well as for more experienced sketchers, so we worked out a programme we hoped would be good for everyone and invited some volunteers to come and try it out. 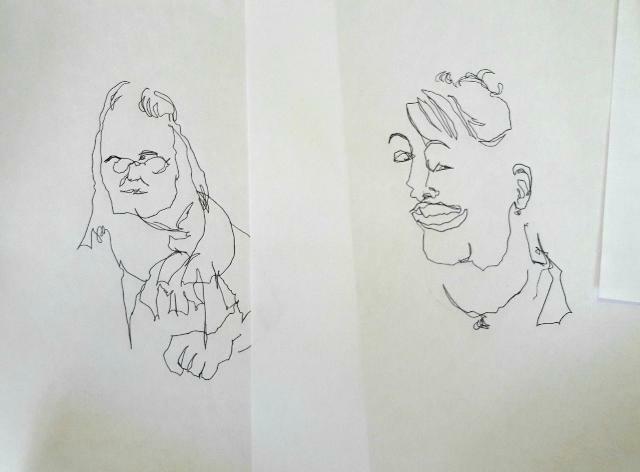 One of the best ways I know to relax and warm up your eye-hand co-ordination and to have some fun is to do some blind contour portrait drawing. You make a hole in a piece of paper and stick this over the pen you’re using, covering your hand so you can’t see the paper you’re drawing on, and you then draw ‘blind’, simply by looking at your subject and feeling your way. The good thing about this is that not even an experienced sketcher is going to be able to make a slick clever looking drawing, but amazingly it seems that everyone always makes a hilariously half-way recognisable portrait – and it’s a great ice-breaker. 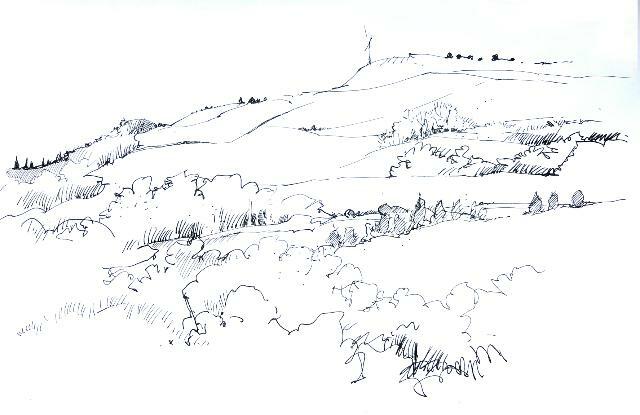 We used ordinary A4 office paper and smooth-flowing ballpoint pens, resting on clipboards, and after we’d done a few of these sketches and laughed at the results we trooped off into the park to do some outdoor sketching using the same materials. Sketching standing up – one of the things we wanted to help people feel comfortable with! 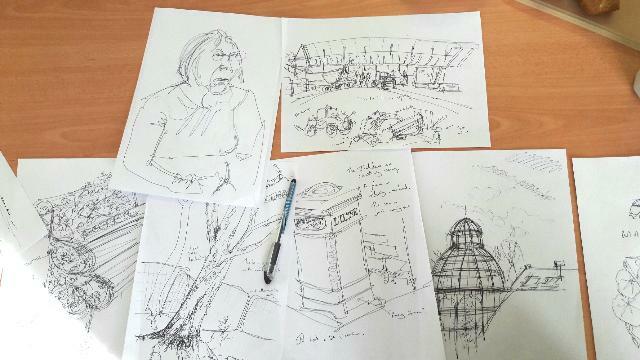 There are some wonderful new sketching locations now – the glasshouse terrace has some great vantage points. I was a bit worried that we were throwing beginners in at the deep end here, (figuratively speaking) but we suggested starting with several quick sketches before meeting up again to compare notes and it turns out that blind contour drawing really does the trick – it makes you realise that you can sketch something without being worried about what happens on the page, and you’re more inclined to look a lot more at the subject and less at what your pen or pencil is doing. Amazing! 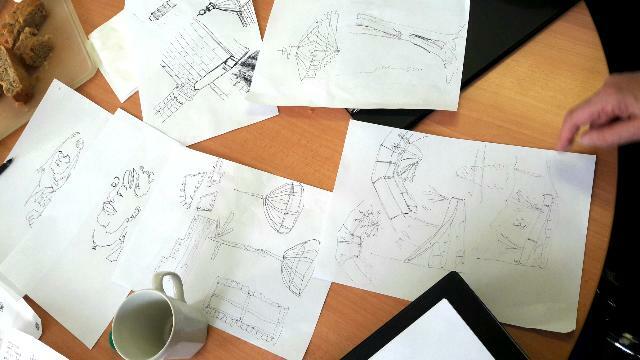 We weren’t short of interesting things to draw. I started by sketching part of the castellated top of the Tower House with the delicate white fleur-de-lis ridge decorations of the glasshouses silhouetted against the old dark stone (I added the colour later when I got home to emphasise the dark-against-light, light-against-dark) but I soon became distracted by watching the rest of the group and I started sketching the sketchers. It was a cold day and luckily everyone had dressed up properly – Louise had even come wearing two pairs of trousers, which says a lot about what sort of sketcher she is – absolutely determined to get out and stay out in all weather. She’s a phenomenally fast sketcher, too – maybe this helps her to keep warm as she can move more quickly from place to place. I can’t draw for longer than 10 minutes or so at a time without taking a break, and I can’t get anything like as much down on the page as Louise can. It’s fascinating to watch her drawing at breakneck speed with intense concentration. and one with a splash of added colour! When I got home I splashed some paint onto it as an experiment – this is just ordinary typing or printing paper, not designed for watercolour – but apart from the fact that the paper crinkles like crazy it is possible to get some colour down in quite an interesting way. We deliberately used simple, basic, cheap paper because we wanted everyone to see how you can make perfectly satisfactory drawings on paper like this and not be intimidated. Sketchbooks can make you feel a bit self conscious – and loose paper sheets are better for sharing and looking at drawings at the end of a session. Smooth flowing ballpoint pens are good for this kind of sketching, too – you can make strong dark lines and faint ones equally easily, and there’s no question about whether or not to rub something out so that’s not a decision you have to make. At the end of the morning we gathered back indoors for tea and cake, to warm up and talk through what we’d done and how it had gone. In just a morning there’s a limit to what you can hope to do, and of course some people had ‘how do I do such-and-such’ questions. We kept it simple, and I hope there will be other opportunities to expand and grow on what we were doing, which was very basic. We learnt a lot from this trial run. Even though the group was small we had a good cross-section of people with very different levels of experience and got some very helpful feedback. Our aim was simply to help people feel comfortable about sketching in the park and to see how drawing helps you to focus, notice things, and put everything else on hold for a while – and everyone agreed that the sketchwalk did all that, so together with having a very enjoyable morning, I’d say that counts as a success. There may be some things we’ll do a bit differently when we do this again, but I think it’s a good start – and we’re looking forward to the next time!